Open to all York University current students, faculty and staff. 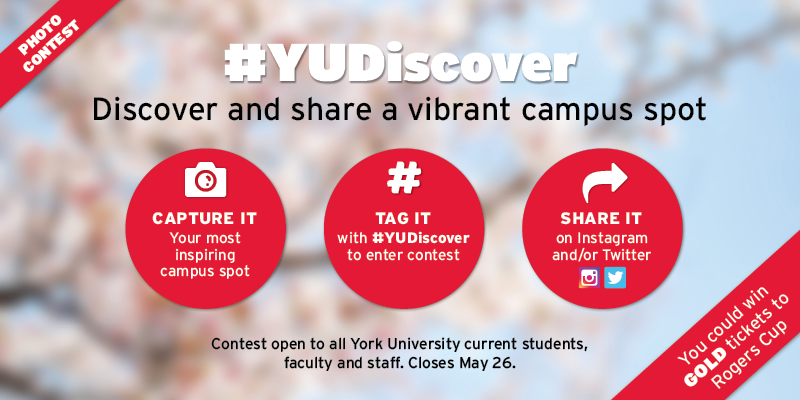 Winning photo must have #YUDiscover in photo. Winning photo can be shared on Twitter or Instagram. Winner will be selected by York's public affairs department May 29th, 2017. Contest entries must be submitted in between May 9th 12:00AM – May26th 11:59PM to be considered for prizes. Winners will be notified by public affairs via Twitter mention or via comment/ message on their winning Instagram photo. Winner must respond to public affairs within three(3) business days of notification, or another winner will be chosen. There will be one prize of a pair of Rogers Cup tickets. Winners will be chosen based on the originality, inspiring caption and visual impact of their photo. York reserves to the right to disqualify entries on the basis of inappropriate content. Refer to full contest guidelines for details.